If someone has passed away turning their Facebook page into a memorial can be a great way for people to pay their respects online. 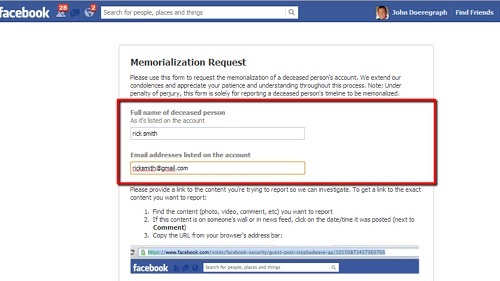 This tutorial will show you how to create facebook memorial page. Go to Facebook and make sure that you are logged into your account. From the home page click on the gear icon in the top right corner of the screen. In the menu that appears click on “Help” and you will be presented with several options including a search box. Using this box search for the term “deceased”. A list of relevant topics will appear below the search box and you need to click on the one starting “How do I report a deceased person…”. About halfway through the answer you will see a link called “contact us”, click this and you will be taken to the “Memorialization Request” page. Enter the name of the person who has passed away and enter their email address. 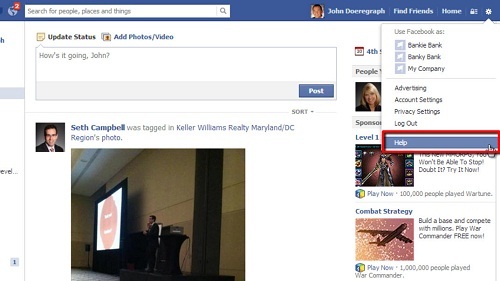 Open a new tab, navigate to Facebook and search for the deceased person. Open their profile and then copy the URL that appears at the top of the page. Go back to the previous tab and paste this into the third text box. You will need to detail your relationship to the person and provide proof of death. Finally check the box to “Memorialize account” and click “Send”. 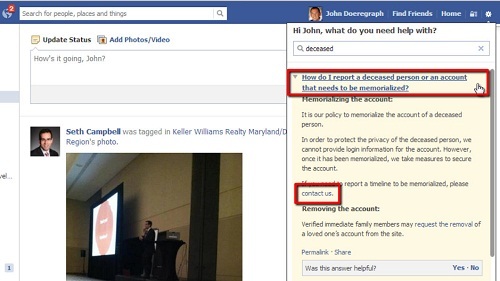 We won’t complete the process here as this person hasn’t died, but that is how to create facebook memorial page.